Located in the city’s urban core, downtown is a vibrant hub and home to some of Atlanta’s most popular tourist spots. 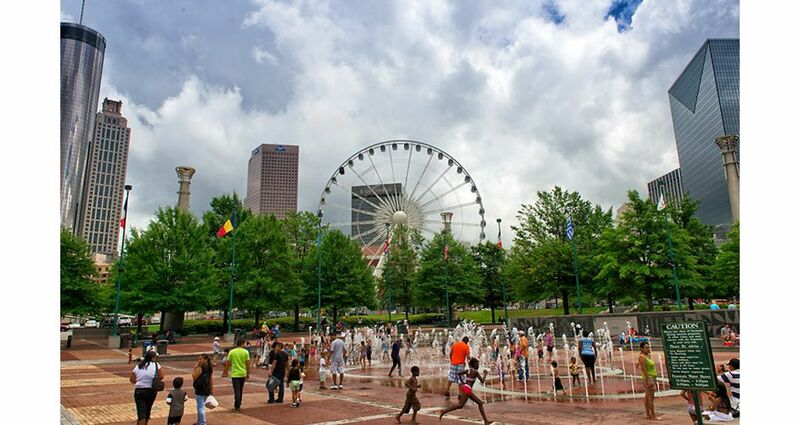 World-class attractions, hotels, restaurants and shops surround Centennial Olympic Park, downtown’s centerpiece greenspace. Downtown’s avenues are walkable and connected. Visitors and locals are more likely to take a stroll or hop aboard the Atlanta Streetcar than drive. Use this one-day guide to discover the iconic history and the lively present of Downtown Atlanta. Morning:Visit Georgia Aquarium to see more than 120,000 marine animals. Enroll in an interactive encounter to dive with whale sharks or shake hands with penguins. Head to World of Coca-Cola to taste more than 100 Coca-Cola products or to the Inside CNN Studio Tour to get a behind-the-scenes look at the first 24/7 cable news network. Lunch: Grab a bite at STATS, located across from Centennial Olympic Park in the Luckie Marietta District. Named among the “10 best sports bars across the United States” by USA TODAY, STATS serves all-American pub fare and local brews you can tap right from the table. ​Afternoon: Visit one of Atlanta’s newest attractions: The Center for Civil and Human Rights or the College Football Hall of Fame and Chick-fil-A Fan Experience. The interactive Center for Civil and Human Rights immerses guests in the American civil rights movement and brings visitors face-to-face with activists from around the world. Football pageantry reigns supreme at the high-tech College Football Hall of Fame. Engage in game-day fun through activities, like Fight Song Karaoke, on-field obstacle courses and more. Dinner: Unwind with handcrafted cocktails and savory small plates at Polaris, the rotating blue lounge atop Hyatt Regency Atlanta. The new Polaris experience is a throwback to the late-60s – leather chairs, retro décor and classic cocktails create a hip, “Mad Men” vibe. Plus, the rotating dome affords glittering views of the skyline. Stay: Turn your visit into a weekend getaway by checking into The Ellis Hotel, an intimate, boutique property downtown. This hotel was originally built in 1913 and successfully fuses traditional Southern charm with contemporary furnishings and amenities. The Ellis is located just four blocks from Centennial Olympic Park. Visit www.atlanta.net for additional ideas on how to spend a fun-filled day in Downtown Atlanta.